Herding Cats …can the Tee-Ball experience be improved? Baseball? Hmmmmmm.....yes, there are bases, and the players are hitting the ball with a bat, but really, Tee-Ball is a bunch of kids in the park playing a different version of tag. Sports, especially baseball, are very different when played by 4-6 year olds. The soccer folks have figured this out; baseball has been slow to figure this out. When was the last time we saw a youth soccer game comprised of 4-6 year olds that had two sides of eleven playing against each other? No, they are playing 4 against four on an itty-bitty field. 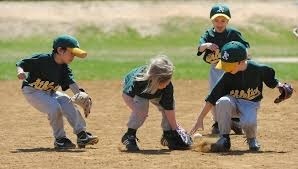 Many youth baseball organizations continue to have teams of 12-14 kids, with all of them playing in the field together. How much action are those six outfielders having? What is the experience like for this young of a human when asked to sit still for 5-10 minutes waiting for a dozen teammates take their turn to bat? We are fighting human nature to ask a 4-6 year old to sit and watch other kids play, but not be allowed to join in. What is the logic in mimicking the game played by mature teens and adults and having teams of a dozen or more players and stashing half the team in the outfield where few balls are hit (at least early in the season)? Let’s give the idea of making Tee-Ball a game of 6 v 6 a chance; played with kids at the four infield positions, pitcher and catcher. l.
These over-sized rosters create additional problems on the offensive side of the game. When we watch the game played at higher levels the players sit patiently on the bench waiting for their turn to bat. We take the game to the Tee-Ball level with delusional thoughts that our little tykes can do the same. Rosters of ten, twelve or more makes the players endure what is an agonizingly long wait, for a very young child, to get a chance to bat. Let’s re-evaluate our antiquated approach to how Tee-Ball is structured. Could it be that the current structure has resulted in a significant number of players leaving the game, out of boredom, long before they had an opportunity to learn what baseball is all about? Have we been losing the opportunity to fill more rosters at the higher levels within our leagues as a result of how the Tee-Ball level is currently operated? Tee-Ball with six kids on a side makes a lot of sense. Teams can be organized with seven on a roster, figuring that on many days we will lose one player to the sniffles, etc. On days where all seven show up, the extra player can be placed in center field (which is about 10 feet behind second base). The extra player, in this scenario, would only get stuck in the outfield one time per game, assuming we rotate defensive positions each inning. Almost all the game action is in the infield. When a ball does make it to the outfield, our little infielders are more than eager to run after it. These little bundles of energy are dying to run around. Chasing the ball into the outfield is a major bonus for them. With fewer kids on the field, each player has a legitimate opportunity to participate in each play. It also makes it easier for each to learn and gain a basic understanding of the game when each is playing an actual position, rather than standing among a mass of bodies. Having a bunch of kids spread out in ultra-shallow outfield depth waiting to accost the infielders each time the ball is put into play is not an environment for learning. When we make the change to six against six Tee-Ball, the kids learn more, have more fun and a higher percentage will return to play again next year. The league administrators I have talked to over the years name increased retention as a top priority, if not the #1 goal, for their league. Let’s look at a few ideas that can improve the Tee-Ball experience for the players (and the adults too). 1 - Start each inning with runners on first and second base. Why not? This is not pro baseball; it’s not high school baseball; in fact it doesn’t closely resemble the game our 11-12 year olds play. With two kids on base and a third player batting we are left with only three little monsters to manage in the ‘dugout’. In addition to limiting the number of kids in the dugout, by starting each inning with two players on base we are getting more kids involved in the game. Those on the bases are gaining valuable game experience. 2 - Kids love to hit the ball and run. By cutting in half the number of kids on a team, we double the number of times each player gets to bat each game. More chances to bat means more fun, excitement and anticipation on the part of the players. Double batting opportunities increase skill development. Greater skill development improves the experience and increases the desire to return and play baseball the following year. 3 - Fewer kids on defense allows each player to handle the ball more often. Confusion is decreased by eliminated unneeded bodies running around creating chaos. In this new environment the opportunity for the kids to gain a better understanding of the game increases exponentially. A common scenario at the Tee-Ball level is the game being played by three kids: The batter, the pitcher and the first baseman. This is a result of many players’ inability to hit the ball past the pitcher. Below are a few simple strategies to improve batting. When our batters put the ball in play on the first swing or two and most of the balls are hit beyond the pitcher, the game moves faster, more players are involved in each play and everyone has fun and learns the game. Swing the bat with the legs - The power in a batting swing comes almost entirely from the legs. Most children only use their arms to swing the bat. his is the most important skill to teach in Tee-Ball. This article explains teaching kids to use their legs to power their batting swing. The article is for kids a few years older than Tee-Ballers. Utilize the technical and teaching points; leave out references to a 'batting workout', 'checkpoints' etc. That stuff is over the heads, attention span and interest of Tee-Ball age players. Distance the Batter Stands from the Ball on the Tee We want the batter to stand one bat length away from the tee stem. Extend a bat from the tee stem to the batter’s hip (while they stand straight and tall). . Incorporate (I will suggest mandate) the practice of utilizing this line across the batter’s box in all practices and games across your Tee-Ball program.This simple practice will make a greater impact on the quality of PLAY in your at the Tee-Ball level than any other single factor. Positioning and Alignment of the Feet The batter’s feet, at this stage of development, should be parallel with home plate. Help the batter position their feet properly. Point out to them that we want to be able to draw a straight line from the toes of their back foot to the toes of their front foot and have that line go straight out to the pitcher. The feet need to be slightly outside than the width of the shoulders (not just ‘shoulder width apart’). Tell your Tee-Ball players to stand with their feet ‘wider than your knees’. When they look down at their knees they should not see their feet directly below their knees. Note: you will notice that most every child will prefer to stand with their feet close together. This is because, at this stage of physical development, the legs don’t have the strength to comfortably stand with the feet wider apart. The kids can develop a level of comfort standing this way, but it will require you to remind them (literally) over and over every day throughout the season. It is important to stick to this constant instruction. When the feet are wider apart, a batter is more balanced and is better able to utilize their leg strength, which is a critical factor in an effective swing. These final points, along with standing the appropriate distance from the tee stem (#1) and correct positioning of the front foot (#2), will give our little sluggers the best possible chance for success. Increased success on the part of the batter equates to more activity and participation for the kids on defense. Hand Position and Grip Hands should be held even with, or slightly above, shoulder level. Both elbows need to be bent to some degree. We want the top hand/wrist and bat to create a 90 degree angle. This will put the barrel of the bat over the back shoulder producing the ‘classic’ bat position in the stance. 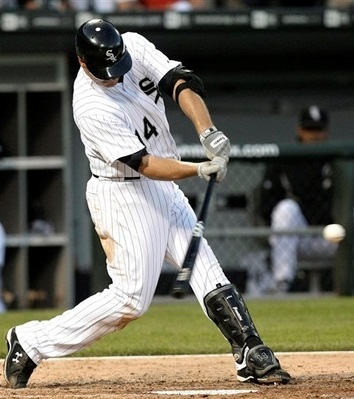 The bend in the elbows and wrist set the batter up to maximize their strength and whipping action when swinging. Note: kids who do not maintain the bend in the elbows and wrist as described are usually dealing with a strength issue and likely need a shorter bat. Grip: Right handed batters have their right hand on top when holding the bat; left handed batters have left hand on top. The hands need to be together; no gap between the hands. As long as kids are relatively close to the prescribed grip and hand position, just let them work with hand position they come up with.I will address batting and the swing in a lot of detail as we move through the fall and winter. Who coaches Tee-Ball? Answer: regular parents from our neighborhood. It is understood that not every parent can run a team because of conflicts with work and other prior commitments. It is understood that there are some parents who have little interest in being involved beyond dropping their kids off and picking them up. It is understood that some parents have multiple siblings and are juggling schedules. However, there are parents who do have the time available to run a team. And it should be clearly communicated to the other six sets of parents that they are invited, wanted and needed to participate in as many practices and games as possible. It is important to work towards the creation of a mindset and culture at the Tee-Ball level that we are all coaches. Ideally, each player has a parent participating in each practice resulting in a 1:1 adult to player ratio. (Before Tee-ball practices begin in 2014, the Baseball Positive Website will provide just the right amount of information to help any parent be an effective coach or helper parent for their child’s Tee-Ball team.) We can establish rosters of seven per team and find a coach for each; the soccer folks have shown us it can be done. Tee-Ball players are the future of every league. Putting in the time and energy to create a Tee-Ball program where every player has a great experience is an investment that will strengthen every league, and the game as a whole, in years to come. The path to the greatest success for Tee-Ball is playing the game with six players to a side. Tee-Ball has the largest number of participants in most leagues. These players are the future of the organization and their parents will be the coaches at the league's higher levels in the coming years. We want the Tee-Ball program to be well organized and head-ed up by a person with experience as an administrator for the league It can be argued that the Tee-Ball Director holds the most important position in a youth baseball and softball organization.